Team boss Carl Johnson insists Panthers can take nothing for granted in their first meeting of a hectic May. The city racers entertain early SGB Championship pacesetters Edinburgh at the East of England Arena & Events Centre - the new name of their Showground track - on Sunday (7pm). It marks the start of a busy spell of eight fixtures in 22 days. 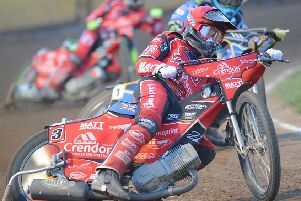 The Monarchs are expected to be heavily depleted with their high-scoring German brothers, Erik and Mark Riss, both missing while Australian rider Josh Pickering is an injury doubt due to broken fingers. But Johnson, whose own side will be at full-strength, stressed: “We’ve just got to focus on our performance and make sure we win the meeting. Erik Riss is riding in his homeland and can only be replaced by a National League rider (Ben Morley) while his sibling, who has piled up the points at reserve this season, is in a GP qualifier in Slovenia the previous evening. His spot goes to Danny Ayres, who rides for Leicester in the SGB Premier and Cradley in the National League. But Edinburgh’s exciting number one, Sam Masters, will make it back to race at Alwalton even though he is in the same Slovenia meeting as Mark Riss. PANTHERS: Jack Holder, Simon Lambert, Paul Starke, Ulrich Ostergaard, Kenneth Hansen, Bradley Wilson-Dean, Tom Bacon. EDINBURGH: Sam Masters, Josh Pickering (or rider replacement), Ben Morley (guest), Max Clegg, Ricky Wells, Danny Ayres (guest), Mitchell Davey.